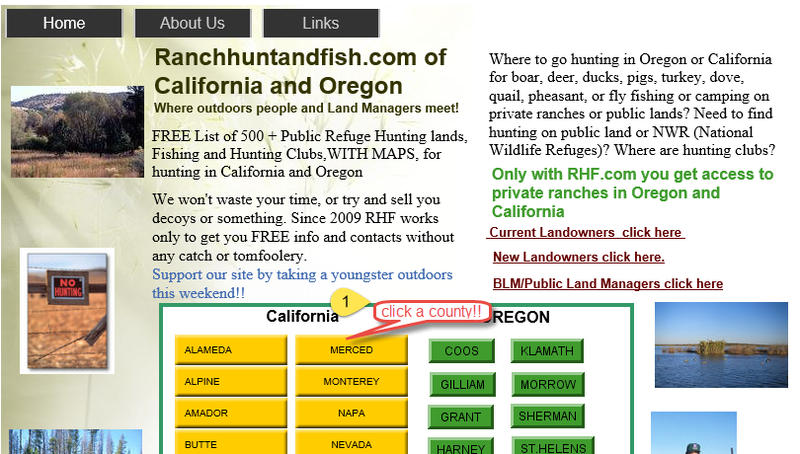 Fishing Map and fishing info for trout and bass fishing in San Bernardino County, California, fishing tips on where to find bass,crappie,catfish and bluegill and trout. 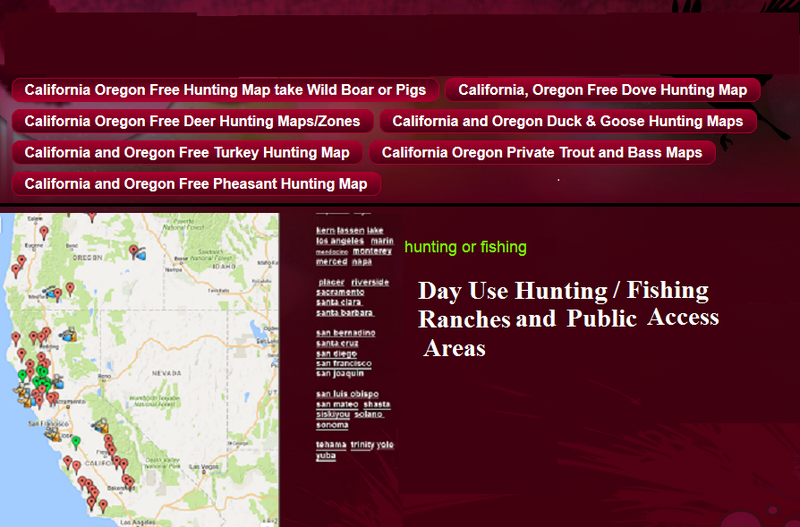 Also info on Hunting clubs and Hunting Ranches in this area for private hunting and fishing in all areas of California and Oregon. Today, California is burdened with some 36 million people, and frankly has poor recreational fishing opportunities for many of them. The Department of Fish and Game started its successful "Fishin' In The City" program to provide recreational fishing opportunities for many urban anglers and would-be anglers, and some city and county recreation departments have done the same thing. One of the best in Southern California is the chain of five winter trout fishing lakes operated by the County of San Bernardino. URBAN SWEET SPOTS: The lakes are located in: Glen Helen Regional Park, with two lakes of 3 and 10 surface acres; Prado Regional Park, with a 56-surface acre lake, Cucamonga-Guasti Regional Park, which has two small lakes that total 11 acres; Yucaipa Regional Park, whose lakes cover some 20 surface acres; and Mojave Narrows Regional Park, with two lakes of 20 and 10 surface acres. All except Mojave Narrows are in the southwest corner of San Bernardino county, the largest county in California, bigger than some eastern states. Mojave Narrows is located on the Mojave River drainage in the High Desert community of Victorville (see map). One or more of these popular winter trout waters is within an hour's drive of almost any city in Southern California. by the County being matched by plants by the DFG. The exception is Mojave Narrows Park, which gets biweekly stockings by the county and the state so that one agency plants each week. According to the County, they stock almost 61 tons of trout in their lakes during the winter. One note: you may find that the parks restrict part of the lake on the day of stocking to give the fish a chance to get used to their new home and to begin scattering out around the lake. the lake should be your first point to check out. The average state-stocked trout in these lakes will run 2 or 3 to the pound these days, but you may be delighted to discover that San Bernardino County purchases and stocks some very nice trout. Mojave Narrows Regional Park, 18000 Yates Road, Victorville (760-245-2226). dates. For more information on the Parks, call San Bernardino County Parks (909-387-2591). such additions to create custom scents and flavors that anglers swear work better than the standard stuff is almost endless. specifically designed egg hook) and rigs with two hooks are common. Lures, or poons like Kastmaster, and theone of the standout lures for trout fishing in recent years wasn't designed for trout at all. The tiny tube jig, commonly called a crappie jig, is an ideal lure for hatchery trout. They come in almost any color you can think of and most have glitter of some sort so they mimic tiny bait fish very well. A pair of these fished together has a darting, twitching action that most trout find hard to pass up. of the hatchery trout you'll encounter. ON THE FLY: Finally, fly anglers shouldn't feel slighted. These hatchery trout offer some good winter fishing when everything else is closed or covered with snow. Simple wet flies and "bugs" such as the Woolly Bugger, Zug Bug, and generic nymphs in olive or black often work as well as anything else. None of the lakes offer float tube fishing or boats, but you can walk the bank and fish. If you find yourself dreaming about the opening weekend in the Sierra this winter, don't wait, try one of these San Bernardino County Park lakes. They offer some better than average winter trout angling.